...you're missing a kitchen utensil and you look in the sandbox before rummaging through your kitchen drawers. Pregnant mothers are apparently at higher risk for serious infection and possible death upon contraction of the H1N1 flu virus. If you are expecting and feel flu-like symptoms coming on, head to the doctor immediately! A pregnant family member of one of the builders was hospitalized recently for H1N1. We're glad to report that she and the baby are well--the little bean arrived a week later and doctors are relieved the baby had time to build antibodies while in the womb. Praise God for a happy outcome on all fronts! Please join us in prayers of thanksgiving and praise. A local boy is missing from the Dallas area. I still think of this Building Cathedrals blog as an offshoot of our Princeton moms emails, but a quick glance at our site meter reminds me that we have many readers. Please pass along any information you may have and pray for Luke and his family. 6'2", 200 lb and 15 year old Christopher Luke Dillier is missing. He goes by Luke. Luke went along with his brother and mother, to his brother's violin lesson on Friday July 24, 2009 around 9 AM in the area of Coit and 635. He mentioned to his mother that he had forgotten something in the family's van and left the instructor's house to go out and retrieve it. He never returned. If anyone has any inforomation about his whereabouts, knows of any suspicious activity in the area, or has any other information, please immediately call 911 and relay the information. Please keep Luke and his family in your prayers. Luke is a sweet, loyal, intelligent young man - devoted to his faith, family and community. His family is desperate to have him back home with them. Please send this link to all you can to get Luke's face out there to bring him home quickly and safely. Please take Luke's picture and post it on your blog in the sidebar with a link to this Facebook page which is an open group (you don't need an account). All of the evidence right now points to the strong probability that he left of his own free will. Whether he had help, nobody knows. What happened to him after he left, nobody knows. It is possible that he is still in this area. It is possible that he's making his way to other parts of the country. If we can get his picture circulated far and wide, we stand the best chance of someone recognizing him. It only takes one to bring him home. St. Raphael, protect him! St. Luke, protect him! St. Anthony, please find him! In the June 19th issue of The Week magazine, an article once again reported that "new" studies have found that there are detrimental effects for children under the age of 2 who watch a lot of TV. In not-so-shocking news, the article reported that when the TV is on, adults speak 500-1000 less words per hour to their children, which can impede their children's intellectual and emotional development. It doesn't matter whether the programming is adult or child-focused; either way, adults aren't speaking as much to children and this is why having the TV on can be detrimental to a child's development. The shocking (to me at least!) news is that 30% of American parents admit to keeping their televisions on ALL DAY LONG, even if no one is watching the programming. This seems like a very high number to me! After my last parenting post regarding the trials we've experienced while raising our little angels (one little angel, in particular), I received many wonderful suggestions for books to read and digest. Thank you to many of you who reached out with kindness and support. I have taken your thoughts and comments to heart and have since been greatly encouraged on the homefront. Of the book recommendations, I immediately acted on two of your suggestions. The first, You're A Better Parent Than You Think: A Guide to Common-Sense Parenting by Raymond N. Guarendi ("Dr. Ray") has been a great read and one I wish to review extensively in a future post. It has provided a serene backdrop for my soul and has assuaged many of the maternal fears of mine that were overgrown and had become exhausting. 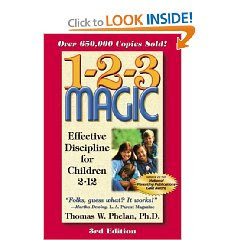 The second of the two books, 1-2-3 Magic by Thomas W. Phelan, Ph. D, is one I'd like to review for you all today. It has set our home up on a system of discipline that is calm, clear, and very easy to follow. First things first, you need to understand that I'm a "by the book" type of gal. Give me a system and I'll put it into action to a T. I like someone to tell me what to do and then I improvise from there. Which leads me to today's book review. Our family had been implementing all sorts of strategies to curb poor behavior, but never with an overall clear picture of where we were headed. I had been searching for a book, a complete discipline system, to define where our family drew boundaries and how we handled consequences. Thanks to 1-2-3 Magic, I feel like we've found our correct path! Two weeks later, we are already greatly reaping the benefits. Dr. Phelan begins by describing a few of the mistakes many parents make in their parenting--they usually talk too much, have too much emotion, and tend to treat their kids like grown adults. Kids don't need all that verbage! They need clear, concise direction. Calm parents create calm children. The more parents can keep their composure, the more in control they can remain. I found these first chapters to be extremely enlightening! Phelan goes on to delineate two different types of behaviors in children and how to address each of them. There are STOP behaviors, or those that parents will want to bring to a halt (whining, hitting, crying, tantrums, etc.) And there are START behaviors, actions parents want to encourage (starting homework, cleaning a room, using manners, etc.) For STOP actions, Dr. Phelan outlines a clear 1-2-3 system of discipline, where the child gets "1", and "2" as warnings for various behaviors and "3" then lands them in a time-out area or time-out alternative. What I loved most about this directive was how EASY it was to carry out! It also works great on the road or in other venues, which Dr. Phelan clarifies in a subsequent chapter. For START behaviors, Phelan offers a variety of techniques to encourage young ones, including natural consequences, motivation charts, kitchen timers, a docking system, etc. to help parents initiate certain behaviors. He ascertains this area is often the hardest to tackle and parents often have to use their creativity extensively to effectively motivate their children. After two weeks of implementing 1-2-3 Magic, I'll agree that its the Start behaviors that are toughest to encourage. We're working on it and I'm constantly revisiting my book for ideas! Dr. Phelan goes on to address specific behavioral scenarios and how best to handle them. These practical sections really help to give the reader a direct view of how the system is appropriately implemented. These chapters addressed questions of mine and helped to bring the system all together. Two weeks in, we're loving it! I can honestly say that I'm a calmer and happier mama. The effect? Calmer, happier children! Looking for some direction yourself? I highly recommend 1-2-3 Magic! Have a great weekend all! "The seventh day is a sabbath of solemn rest, holy to the Lord." We just returned from a wonderful vacation from Colorado, replete with exploring, digging, wading, swimming, collecting and just enjoying nature and family. We drove all day saturday, pulling in in time to tuck the boys into bed. Sunday was a strange day....a day of washing, folding, unpacking, grocery shopping, and organizing. We went to mass in the evening instead of at the crack of dawn, because my husband had to fly home from the opposite coast from a wedding the previous night. Monday morning felt like it should be a saturday. Exhausted and out of our routine, coupled with the need to make doctors calls and talks with the insurance company, I felt that I had missed Sunday: a day for rest and refrehment, both physical and spiritual. I have some vague idea to do less work on Sundays and to be more purposeful about spending time with family. But the reality is that the needs of little ones are so great and urgent that many things must still be done on Sunday. ("The Sabbath was made for man, not man for the sabbath.") The CCC says, "On Sundays and other holy days of obligation, the faithful are to refrain from engaging in work or activities that hinder the worship owed to God, the joy proper to the Lord's Day, the performance of the works of mercy, and the appropriate relaxation of mind and body." How do you all go about setting aside the Lord's day for your family? I remember being confused as a child when my mother would say, usually towards the end of our family vacations, that she couldn't wait to sleep in her own bed again. This was her way of saying that she was ready for our family "vacation" to be over, and I could never quite understand why she would think this! After all, I loved vacation and would have stayed forever if I could have! Now that I'm the parent, I understand my mother's words much better than I did as a child, although I must say that our first "real" family vacation was a great one. We just returned from a week at the beach with extended family, and we had a wonderful time! While it was nice to sleep in my own bed again, I could have definitely spent a couple more days playing on the beach and spending the days with family. Only 5 days until we depart for our summer vacation at the Jersey Shore. I'm busy packing, cleaning, doing extra laundry, organizing, and PRAYING for peace this week. I hope your Monday is going well! While watching my four-and-a-half-year-old daughter play outside in wind and sunshine this week, I was struck by something very refreshing. This child does nothing superfluous to herself. She cleans, feeds and dresses herself well. Vanity and peer pressure do not yet factor into her decisions. The imposed desire to improve her appearance for the approval or attention of others is still distant - or at least minimal - in her consciousness. As soon as she was able to make decisions for herself we allowed her the liberty of selecting clothing that is appropriate to her planned activity and the weather, regardless of how color coordinated or fashionable it was. She continues to avoid uncomfortable things because, well, they are uncomfortable. She lets me cut her hair into an, immensely-practical-albeit-not-super-fashionable, bowl cut. Smearing her face with chemical pigments or punching holes in her ears have not yet crossed the threshold of acceptability in her mind. She enjoys articles of clothing because of what they look like, not what they make her body look like. In other words, a practical but shiny one piece bathing suit will trump a revealing two piece any day. I love this phase. I know it is fleeting. I know the day is coming when I will have a six year old who yearns to look like the older girls and who may not accept my explanations about practical and modest dress as readily as my current cutie. Nonetheless, I just wanted to share my appreciation of her total lack of vanity and the ease of living I witness in her as a result. We are called to have "faith like a child", well my new plan is to strive for the "humility of this child" as well. I realize that Sarah Palin is a pretty controversial political figure these days. It seems she is either loved or hated--less for her politics than for her her personal choices. I thought the following article was really interesting, and provided some interesting insights into how the strong emotions Palin evokes represent the cultural divide among Americans on two hot button issues: the right to life and disabilities. Palin is controversial, in part, because America is divided over disability. We’ve established laws and institutions that protect people with disabilities. But we also do everything we can to make sure they don’t see the light of day. Trig is a reminder of our fierce ambivalence over disability. Every mention of his name is a pinprick to our conscience. Every photo of mother and son is a reminder of concepts —vulnerability, dependency and suffering — our culture no longer tolerates, as well as virtues, such as humility, dignity and self-sacrifice, it no longer extols. Trig is also a reminder of an inescapable truth: Disability is an inherent part of the human condition. At a time of deep cultural divisions, 1-year-old Trig Palin represents the deepest division of all, between a culture that increasingly sees genetic perfection as an entitlement and a culture still rooted in the belief that human beings are defined not by their capabilities but, instead, by the very fact of their humanity. While I don't think the issues mentioned in this article are the only reasons Americans have such strong feelings about Palin, I do think the divide is a very large contributing factor. Obviously any politician will evoke feelings of discontent from those with opposing political opinions. When someone speaks of their hatred for George W. Bush, they roll off a litany of concrete political decisions with which they disagree. With Palin, however, the hatred (and often the praise), is primarily directed at her personal life choices. And this is where I think the article hits the nail on the head. To most Americans, Palin isn't just another politician, but a representation or a critique of one's own personal values and choices. Here is a theme in modern marriages. Husband wishes for wife to set aside a little more time and care for romance; to look forward to date nights rather than worrying so much about leaving the children; to linger together in the evening instead of darting off to chores or projects; to insist that the children go to bed on time and stay in their own bedrooms; to try to present herself nicely when he arrives home. Meanwhile, wife resents husband's requests, certain that he has no idea how exhausted and overworked she is, how mind-bogglingly many are the demands of her day, and how worried she about the children’s well-being and development. There is a wildly unhealthy culture of pressure on mothers, Christian mothers included. We work ourselves ragged and worry ourselves sick, managing every minute, giving ourselves and our children no breathing room, as if their well-being was entirely in our hands and letting up for one minute would ensure our failure as mothers and their failure as human beings. We’re determined to do better for our children (enrichment activities, superman nutrition, careful education, spiritual formation, structured play) with less support than mothers have ever had. Meanwhile, our society views the institution of marriage and individual marriages as less important than ever. The upshot is that we receive none of what would be good community pressure to be faithful, caring wives. All around us, wives slander and dishonor their husbands, and they eventually pick up and leave to explore the greener grass on the other side. These two pillars of modern life tempt us to neglect our marriages while wringing every drop of energy out of our bodies and spirits to raise “perfect” children. Correctly prioritizing within our hearts is necessary for our own mental and emotional health and for the well-being of our families. As Christians, we understand that our loves are correctly ordered when they are God first, then husband, then children. I need to continually re-examine whether I’m living this. Our Lord asks that we put Him first, that we let him be the breath of our lives, that we do the best we can with what we’re given, and entrust Him with the rest (or as my favorite parenting author puts it, “All I ask is that you do the best you can. Struggle to surpass yourself in loving service, and leave the rest to my almighty power….”). Second in importance, we cleave to our husbands, cultivating our love and unity so that it refreshes and inspires us as women and overflows naturally into our lively mothering. I don’t think this is a nice string of sentiments; I think this happens, with grace, if I let it. I’m also pretty sure that living this way is much easier and happier than going it alone as anxious, burdened, resentful Supermom. Our vocation and our call to holiness is to learn to fall more in love with the person who we fell in love with, chose, and love more than anyone else on earth. That’s amazing. I can’t believe I get so sidetracked sometimes. Time, effort, and even money spent figuring out how to make our marriages thrive is unquestionably worthwhile. I think it’s not a matter of finding more time or energy in a day but rather reprioritizing, giving ourselves space from our other cares and responsibilities in order to make adequate room in our hearts for our husbands. We are asked to tithe to support the Church; there’s a good argument to be made for similarly trusting God by setting aside money even on a tight budget as a necessary expense to support our marriages, for date nights or for whatever else we enjoy doing together. Babysitting. Planning ahead for date nights at home. 90 seconds for makeup and perfume. Listening more than talking (I always blow this one). More babysitting!! I find after only five years of marriage that investing in marriage pays dividends in many forms. Mom is happier, more lighthearted and more detached from the cares and ups and downs of daily life with the children. Dad loves being in love, coming home to delight in his bride, laughing together as they acknowledge and enjoy the many blessings of faithful Catholic family life. Children are secure in their proper place in the family, as the fruits and the beneficiaries of a living, life-giving love. While the pasta water is boiling, halve the tomatoes and stir them together with all the other ingerdients, reserving 1/2 cup parmesan. Cook and drain pasta, then toss it in a large serving bowl with tomato mixture and sprinkle remaining cheese on top. This is an obscene amount of cheese, but it makes a really amazing meal! We serve this with grilled chicken sausages from our local farm and a salad of homegrown lettuce! Tonight as I escorted a young man of mine to timeout, my finger slipped on the microwave timer and punched 40:00, rather than our usual 4:00. On this Tuesday morning, I would like to know if anyone else out there has created a Land Before Time name for one of their children? You know, do you have a Spike, or a Flyer or a Swimmer? I have recently deemed my soft, chubby 18 month old son "Warm Neck." I truly love getting into that neck. Yum. Which characters populate your home? Last week, in the confessional, among other sins, I confessed to disorganization and a general lack of discipline with certain household tasks. While I try to maintain an orderly home, my house contains certain "hot spots" or regular problem areas where disorganization is the rule, rather than the exception. Throughout the years, the laundry is consistently one of these areas. With each child there is more laundry, and the disorganization grows. I have tried different systems, kept them for a very short period of time, and then resorted back to the periodic laundry emergency system (PLE system)--the kids have no clean clothes so it it time to spend the entire day doing laundry. About once every day 7-10 days, we would hit crisis mode. Mr. Red wants me to let all our readers know how mean I am to him when the emergency periodically arises. The periodic emergency system has seen some small improvements over the years. After the last baby I started doing at least one load per day, but do not take the time to fold or sort the clean laundry. This resulted in the periodic folding emergency system, also known as the PFE system. This is the system currently in place. On most days our guestroom serves as a very large disorganized dresser. At any given time, there are about 8 loads of clean laundry dumped in a very large pile on the bed. Eventually the emergency strikes, and I have two children and my husband spending 1/2 hour each morning sorting through clean laundry to find a matching pair of socks. Mr. Red rarely complains, as he sees the PFE system as a huge improvement over the old PLE system--clean lost socks are better than dirty socks, right? Our daughter disappears for hours at a time looking for a specific treasured outfit. Our son simply wears whatever is left in his dresser, regardless of color scheme or season. Eventually, we are late for something important because nobody can find their clean clothes, or someone is dressed in a completely inappropriate outfit. I then declare an emergency, temporarily suspend all unnecessary activities, and spend several hours folding laundry. During confession, I began to explain my laundry system to a good priest. He said that in many ways, the laundry represents my spiritual life. I'm good in a crisis. When an emergency strikes, I can really buckle down and get through the rough patch with focus and concentration. I don't get overly stressed by the "fire" or "emergency" AND I feel a real sense of accomplishment when the job is complete. I always feel really great when I am finished folding the laundry and everything is really organized. The way I see it, the messier things are to begin with, the better the rush when the folding is finished. Spiritually, I rely on God very well in times of crisis. Each rough patch seems to remind me to pray and seek God's help. When the emergency passes, so does my perceived need for prayer and assistance. Daily discipline is where my prayer life needs the most work. Taking a specific time each day to offer my whole self to God is a constant challenge for me. I will spend time daily doing so many other tasks, but praying only seems to make that priority list when the going gets rough. A set time of prayer, even just 10-15 minutes, must be a part of my daily routine. I tend to make things part of my routine when there is an immediate consequence for failure to accomplish the task. Kitchen cleaning, for example, is something that has to happen immediately after a meal. If the dishes sit, they are much harder to clean. If pancake mix dries on the counter, it takes 5 times longer to scrub it clean. Ants make a permanent home in my kitchen if things are not thoroughly wiped down each evening. For all of these reasons, I clean my kitchen well each night. While I am sometimes rather tired, I do this task with a general sense of peace, a purpose, and I am able to offer the work to God. As a busy wife and mother, my household tasks, when offered to God, will be my main mode of prayer. Offering each folded sock and each folded shirt as a prayer for it's owner is much easier when my folding is done as part of the rhythm of our week. Currently, my system of emergency folding makes this sort of offering almost impossible. When emergency strikes, my sole focus is on getting the task accomplished in as little time as possible, not in offering my work as a prayer for those I hold most dear. I become task-oriented, not people-oriented. I tend to view my spiritual life this way as well. Time with God can become something to check off of a "to-do" list, rather than about fostering a life-long relationship. Living in emergency mode only increases my tendency to focus on the task, rather than the person. I am not naive enough to think that we can have a system or a routine for everything in our lives. In the life of a mother emergencies will inevitably occur. For this my disposition is a huge blessing. But living with emergencies that can be easily controlled and avoided by basic discipline has poor consequences for my relationships with other people, and especially for my relationship with God. In all honesty, the laundry, absent some terrible stomach bug or a recent return from vacation, should never be an emergency as it is as predictable and certain as the mail. While failing to fold on a particular day doesn't have the same immediate consequence as leaving a bunch of dirty dishes in the sink, it's consequences are long term, and have an effect on my relationships with other people. The days when I am folding, I rarely take the time to just sit down and play with my children. It is hard to enjoy their presence when I am thinking about the task that lies ahead. Similarly, my relationship with God suffers as I struggle to be docile to the Holy Spirit when I'm frantically folding my 7th pile of laundry. And it is these relationships that are the real call of my vocation. I organize my home and accomplish many tasks each day, not because I fear the consequences or because it feels good to look at an empty laundry basket, but to serve the wonderful people in my life. Such service is done in the most loving manner when it is regular, timely, and always focused on the person behind the task. And this is my new resolution with the laundry. Every since we moved to Virginia over a year ago, I've been searching around, trying to find my place in this big city. We came from the thriving "Catholic Disneyland" of Notre Dame, where we were surrounded by budding Catholic families, ample fellowship, playdates galore for the kiddos, and faithful encouragement. 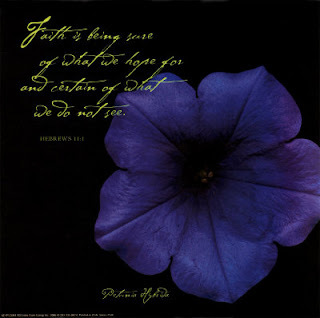 My Catholic faith soared as I shared weekly Bible studies with 8 other women and had regular community with like-minded believers, gals walking the walk and talking the talk. Before that, we were amidst military life and other couples starting out in marriage. I sought solace in the companionship of other women who were in the same realm in life. They were women of great faith--their prayers got them through fearful nights while their husbands were away. When the hubbies returned, we baby boomed with the best of them as we all began to welcome children into our folds. Before that it was Princeton, land of the academically rigorous and spiritually devoted. We praised and worshiped. We prayed and communed. We retreated and sought solemnity like I had never seen before. My faith came alive for the first time on my own. I became Catholic. You could say I've been spoiled. Everywhere I've been in the last 12 years of my life has served to be a ready-made group of faith-filled individuals and spiritual community. I've never had to work for it. God provided and I accepted, readily. How do you find Christian community in your world? Have you started a group on your own or reached out to join something already established? I would love your suggestions and insight as I seek to add a little faithful flavor to my day to day. Blessings! My secret: laundry detergent in hot water, LOTS of blotting with white towels; wetting, blotting, wetting, blotting... finished off with a steam cleaner. Voila! Thank goodness! This clumsy mama dropped blue finger paint in the kitchen only to look up in horror at the splatter distance!! That stuff can fly! Last night while I was finishing up bathing the twins, Leo (18 months) locked himself in the girl's bedroom. I could not get the windows open from outside the house, but I did finally figure out how to take apart the doorknob. Once I rescued him, I (cleverly) put the door knob back on in the other direction, so he couldn't lock himself in the room again. Tonight, while I was helping the twins get their pajamas on, he locked the door from the outside! All of us were in the bedroom and he was alone, screaming again, on the other side of the door. This time I had to send my big boy out the window so that he could go around and rescue all of us. Lion is the cutest, sweetest huggiest kid I have ever known, and he gets into more mischief, too! It's funny, I did not know that there was a summer decluttering bug, but I have definately caught it. I am emptying my desk to get it ready to be PT's place for school work -- he (like another Peter I know, coincidently) works well in a room of his own where he can focus on his projects without me hovering or siblings distracting. However, I also know that I need order in my life and in my brain much more than in my home or desk, that is the part that I am really struggling with of late. So, parallel to the desk project I am also thinking about what my goals are as a wife, mother and teacher, so that, come fall, I don't lose what really matters under a pile of laundry!
. “True order does not always mean orderliness. True order lies in loving God first, then spouse, then children, then home, and lastly, community,” Abby noted. She said that in some homes, authentically living these priorities will result in a home that might be untidy at times. In November the mother of a friend offered us a hand-me-down train table for our boys. At the time, Charlie had a limited number of trains and tracks, but played with them frequently. We jumped at the offer, and gave him the table and some new trains and tracks for Christmas. He initially loved them all, but soon lost interest. While the table has gotten some very limited use during playdates, overall, it sits idle, taking up precious space in our living room. The trains have been used very rarely, if at all, since January. I had begun to think that Charlie just didn't care that much about his trains, until this past weekend. At the request of one of our children, Mr. Red put a new battery in one of the engine trains. He then brought all the trains into the kitchen area. All 3 children played happily with the trains for hours! Augustine (18 months) and Charlie (3.5) have returned to the trains as their toy of choice all weekend. On the kitchen floor, the children have built an extensive track. In the past, the train table severely limited their options for using bridges and switch tracks. It was only with our assistance that they could design these sorts of track schemes within the table confines. But on the floor, the sky is the limit. And so all of this has left me ready to post our train table on freecycle. At present, it's only justifiable use seems to be the storage bins beneath the table. Am I being hasty here? Besides storage, is there another reason that I should keep the table? Ten hours of sleep... continuous! A feat that's truly and really stupendous. This is a rare sleep-beneficial combination, woah nelly! A blink of my lifespan to arise with no cranks. Here's hoping you have a WONDERFUL day of celebration with family and friends. 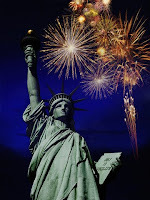 What a blessing to have one day set aside each year to reinvigorate our patriotism and to thank God for our country. This is a link to a New York Times article which I thought that it was worthing knowing/thinking/praying about. Okay, so I know that we have closed the comments on the modesty/jumper issue, and I am not re-opening the debate here. I am a Land's End (on sale) shopper for most of my everyday clothing, and (like B-Mama) I like to save up and splurge for special occasion wear (I have a great go-to suit from Ann Taylor, it looks great, fits well and I have worn it so many times it has more than justified the price). However, I do like to wear skirts (or slightly dressier slacks, even) to church, it makes it feel like I am setting the day apart. My kids notice, too, that I require them to dress up for church, and for my girls that means little dresses, so they ask why I am not wearing a dress. I loved the comment from Anon4 about stopping wearing make-up while at Yale, because long before I was a homeschooler I had some hippie-chick tendencies and back then my summer staples were broomstick skirts, or tied Balinese sarongs, and birks. In the winter time I wore my mom's old kilts with thick dark tights and boiled wool clogs, so I associate these things with rather a liberal look, actually! Lately, I have been thinking that those skirts would be cooler and more practical, my khakis are killing me in the heat and humidity and I have never really felt comfortable in shorts outside of the athletic field. So, anyone have good luck finding nice mid-priced skirts or church attire lately? After I ran over a curb at the bank, Dash said excitedly: "Mommy, are we off-roading?!?" After I (exasperatedly) asked Dash what he was doing as he hacked away at a golf ball in the flower bed he exclaimed, "What! I'm using my sand wedge!" Red posted last week on her families berry picking adventure. The Incredible family did the same as well and we just finished making a batch of homemade blackberry jam this morning. Like Red, I think great books are a must to go with most family activities! Blueberry books at Dawn's blog (also at bottom of post). One not mentioned: Jamberry by Bruce Degen.